Safety is an essential part of using a car. This is very important especially when your car is being parked. The last thing every driver want is seeing their parked vehicle suddenly inching away or even worse moving away because of the brakes has been displaced. There have been stories ranging where the unsecured vehicle rolled off due to uneven terrain or failed to have all the necessary support. Not only could this damage your vehicle, but people can also often be injured in panicking efforts of escaping. Luckily, this can be prevented with the use of wheel chocks. It adds extra support to your braking system ensuring your car isn’t going or moving an inch. Wheel locks provide extra security for your car. If you are in the market for one, you are lucky as we have reviewed the best product in the market putting in some vital consideration like performance, durability, quality and other relevant factors that affect usage. In this article, we will be reviewing the X-Chock Tire Locking Chocks. The BAL X-Chock provides stability and prevents tire shift by working with the tire’s natural movement. The tire locking chocks apply opposing force to tandem applications and prevent any movement when parked. Best for protecting trailer and RVs from inching away or rolling off. The x chock tire locking is the best in the market that combines high-quality material, durability, and high performance at a budget-friendly price. The tire stabilizer is lightweight and easy to store in the trunk or the garage. Made in the USA, the tire locking is designed to fit between two tandem tires, features a rust inhibitive coating and a plated ratchet wrench. The chock requires a little setup. The best way of securing your RV without spending too much and getting the maximum security for Trailers and RVs is by using the wheel chock. Unlike other products in the market that will only stop your camper from rolling, the BAL X-Chock will eliminate almost all tire movement and prevent your vehicle from moving away. X-Chock Wheel Stabilizer can be used for several purposes. The wheel chock can be used to keep the vehicle from rolling when the other end is lifted. 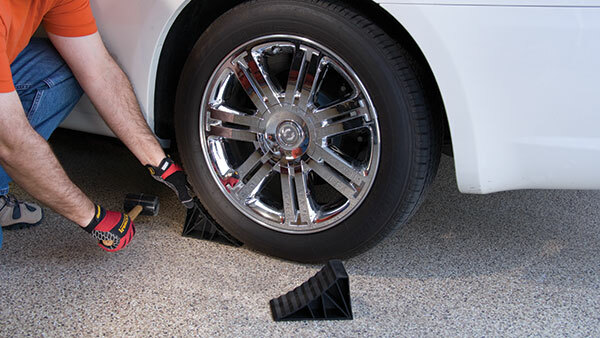 The wheel chock can also be used to secure medium or large parked cars from rolling or moving when parked. Also, an airplane can also use the tire stabilizer to keep them from moving from their parking spot. The X-Chock Tire Locking Chocks design features hardened steel protection, rust inhibitive coating and plated ratchet wrench. This is purposely set so to grant your vehicle with additional stability and prevent tires from shifting. The chock is reliable and offers instant security for your property. The X-Chock works in line with tire movement by opposing force to tandem tire application. The Plated ratchet wrench provides the chocks with added security and protects it from any attempted movement. The whole body of x chock tire locking is made of durable material. The metal is lightweight, sturdy and very resistant to wear, tear and bad weather condition. The chock is easy to store, engage and maintain. The heavy-duty steel material is very tough and durable. The chock also offers security and very resilient towards auto theft and burglaries. On the whole, the chock is very convenient and straightforward to use. 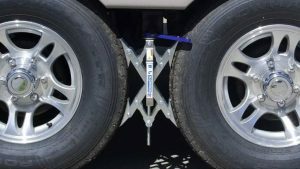 Once the X tire chock has been installed correctly no need to worry about any movement when parked while you are away. Though you might have to follow their easy and straightforward instructional manual for installation. As long as you do it correctly, the chock fits with no hassle and difficulty. The X-chock is well designed to support and secure your vehicle from movement so be sure you place the chock correctly to avoid significant disasters. The scissor wheel chocks come at a budget-friendly price for customers looking to secure their trailers, RVs, and other heavy trucks. Safety should be the first thing every buyer should think of especially when choosing their tools. There are several designs in the market, but the X chocks stand out as one of the most efficient, reliable and the safest. The jack is portable to a reasonable extent. As long as you place correctly, then the chock is unlikely to fail you. The X-Chock Tire Locking Chocks is very simple and straightforward to use. A one-time read through the user’s manual will give you a full understanding of how to use the chock. Could damage tires if mishandled. Requires caution when installing or uninstalling. Can have trouble with wet or muddy tires. The X chock is made from durable and quality material that resists wear, slipping, tear and weather. This product can be used to protect and secure your trucks, RVs, trailers and other applications against any movement. The patented design allows the chock to be installed with less hassle and can be removed in little time. The Bal Scissor Chocks remains the best in the market. The chock is easy to use, economical, requires little maintenance, and offers the best performance.